Here are some great lawn care tips to help you keep your lawn in great shape as there is nothing more inviting than a lush and green lawn that surrounds your home. Keeping your lawn in perfect condition is not always easy especially when you have things to deal with like sun, animals, and water restrictions. And very often, what should be the ideal frame for the wonderful colours in your borders, beds and containers can end up, despite our best efforts, looking very shabby and uncared for. So how can we make sure that our garden centerpiece remains in great shape come what may? This is an important aspect of keeping your lawn healthy, but only fertilize when the soil requires it. To tell if your soil is losing valuable nutrients, you can buy a soil testing kit at your garden center to let you know if it's time to fertilize. If you are unsure of what types of fertilizers to use, ask your garden center expert to direct you to organic fertilizers that won't harm the environment, your lawn or pets. Thatch appears as a layer of dead or living shoots or roots and stems that may break through the lawn surface. When dead shoots or roots appear, pull them from the roots or buy a good organic weed removal product to keep them to a minimum. It goes without saying that water is important for a lush, green lawn. Beyond over watering, there are other things to consider when taking care of your lawn. If you live in a large city or town, you may have a limited number of days that you are allowed to water so keep those days in mind and mark them on a calendar so you remember to water on the appropriate days. Learn more about the climate in your area and if you are prone to droughts, you may consider installing an irrigation system to help your lawn thrive in the dry months. Look for lawn varieties that are best adapted to your area - not only will they perform better but they will also be less of a drain on the natural resources. 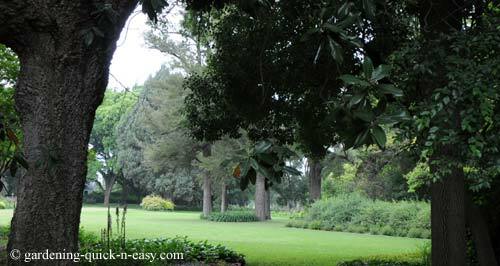 Pests can attack a good healthy lawn as easily as they attack trees or plants. Get a good organic pesticide for your lawn and follow the directions to keep your lawn free of pests. Mowing your lawn is important to keep it healthy and growing. To ensure good mowing, check the blades on your mower and make sure they are sharp enough to do the job. If they are not, replace them as dull blades can ruin a lawn. When mowing your lawn, move in different directions so you'll get rid of any weed growth. 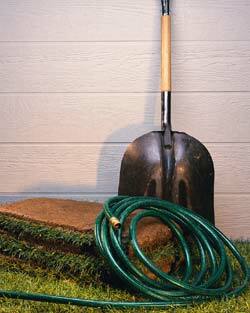 Turn your clippings into mulch for your garden. Often lawns will get brown spots - from over watering to animal urine stains to foot traffic on the lawn. To rid your lawn of brown spots, turn the soil and water and the grass should re-grow. If not, you may have to turn the soil and re-seed the lawn to get rid of brown spots. If you have just bought a new home and you want to grow a healthy and lush lawn, seek out the types of grass seeds that do well in your area or ask your garden center about sods and how to install them and take care of them. 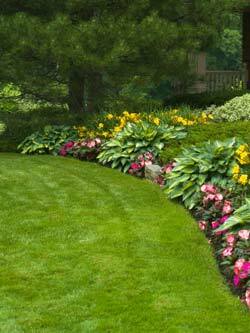 Keeping your lawn healthy and lush can be easy if you put some effort in and take care of it. To keep your lawn from developing non-wanted brown spots from traffic, consider putting a fence or rock border around your lawn. Take a trip to your lawn and garden center to get expert advice and the best lawn care tips to ensure your lawn will stay lush, happy, and healthy all year round. NOTE: You may contemplate signing up with a lawn care business to take care of your lawn. Here's a good Free Lawn Care Contract for you to look at. Take note especially of the obligations, liabilities and insurances that should be in place. You can also take a look at the Lawn Care Schedule to see which services may be on offer and which you could take care of yourself.